Yes, of course Rosa is remembered nowadays as a powerful woman in an overwhelmingly male movement, but the fact that she was Polish Jewish is also significant in light of the utter depths of defeat and the rise of genocidal fascism. And there are many other reasons to remember her. In January of 1919, Polish-German revolutionary socialist Rosa Luxemburg was murdered by far-right thugs. One hundred years later, this brilliant theorist and organizer -- dubbed "The Living Flame of Revolution" -- is little known on the left in North America. 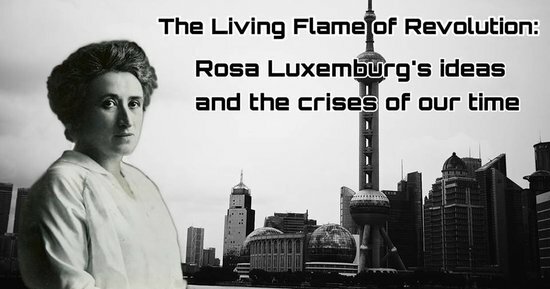 Much has changed since 1919, but as capitalism threatens us with devastating climate change, austerity, and a growing far-right threat, the centenary of her death is a good time to learn about Luxemburg and discuss whether her ideas are relevant today for people who want to transform society. Actually, the 'far right thugs' she was murdered by were the social democrats under Friedrich Ebert. It's a little more complicated and insidious than that. The thugs were called the Freikorps-a lot of them would eventually join up with Hitler and Co. Ebert's SPD(the same crowd of cynical bastards who voted to give unquestioning support to the Kaiser's war), armed the Freikorps and sent them off to crush the Spartacists, because Ebert hated actual socialism while endlessly watering down his party's "social democratic" program to next to nothing. Ebert, though he never would have wanted this outcome, bears a significant level of responsibility for the rise of Naziism due to his encouragement of the right-wing pre-fascist street thugs who murdered Karl and "Rota Rosa". Had the Sparticists, with their independent outlook on revolutionary socialism, prevailed in 1919, it is likely that neither Hitler nor Stalin would ever have come to power, and it is also much more likely that the international Communist movement would never have degenerated into the pathetic cult of "Uncle Joe" that it had reduced itself to by the early Thirties. And I'd go even further than that and argue that, had Rosa Luxemburg's version of "spontaneous" revolution succeeded in Germany, the rest of Europe, and the rest of the world, neither Russia nor China would be under the cynical, repressive, and essentially right-wing dictatorships they live under today. ..yes the spd killed her. ken, your account is in line with this short video by redfish.